Pilates is a system of exercises to strengthen and stretch the body and in turn improve tone and posture. Pilates also stimulates the neuromuscular system which promotes better coordination, also circulation is improved through deep healthy breathing. It is proven to be very beneficial for people suffering from back pain, as the exercises promote strong back and abdominal muscles. Pilates is performed in a calm manor so is fairly easy to follow. The exercises are ‘deceptively’ strong, but achievable. Pilates is about quality of movement, rather than the amount of repetitions. Pilates method shapes a body that is long and lean. It will heighten your awareness of the position of your body and of your position in space. In the mid forties a lady called Eve Gentry, taught Pilates for Joseph in the first and only Pilates studio. In April 1991 Eve Gentry and her associate Michele Larsson along with Joan Breibart started “The Institute for the Pilates Method” now known as “Pilates Physicalmind Institute” the first membership and certification organisation for Pilates professionals. 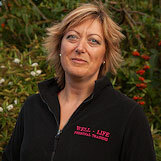 In 2005 Joan introduced “Standing Pilates” and I become one of the first certified instructors in the UK in 2006.